Local knowledge is a wonderful thing; inside knowledge is even better. That’s why, after his analysis last year, we again tracked down Ian Pope, coach to five swimmers selected for the Montreal World Championships in Giaan Rooney, Michael Klim, Patrick Murphy, Brett Hawke and Matt Welsh. 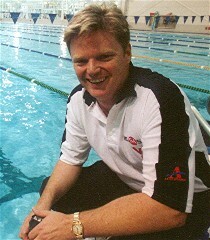 Ian himself is a member of the coaching team for that squad and it was also a successful meet for his own programme, with his club Melbourne Vicentre again taking top club honours. But what did he make of the week’s swimming and in particular the performances of his top swimmers? How do this year’s trials reflect on Australian swimming? The women have been outstanding. Every stroke has gone to another level. Our backstrokers are faster than they’ve ever been, our breaststrokers are breaking Australian records, our butterflyers have been very fast, with three of them in the world top four at the moment, and the freestyle was just amazing, so I think it’s an exciting time in Australian swiming. There are some weaknesses, the men’s sprinting programme for example where there isn’t enough depth really, and we still have to look at ways to develop in those areas. Coming off an Olympic year do you see these trials as a rebuilding phase? Not really rebuilding, but of course we’re still looking to fine tune and improve from last year as it’s big year for Australia coming up, leading into the Commonwealth Games in Melbourne, which will be an exciting period. A lot of British swimmers have been targeting qualification for the British team later in the year, having had breaks after the Olympics and not quite being back at their best. You don’t seem to have had that problem with your swimmers. We didn’t have that big a break after the Olympics and those swimmers who did have a break maintained a lot of their fitness in that period. I’ve looked at the next few years as a whole and probably we’ll have bit more of a break after the Commonwealth Games with a different emphasis in the training then, but I felt it was important after the Olympics that they continued to go from there. From your perspective, you must be pretty happy with the performance of Vicentre this week? Yes I have been very pleased; it’s been a great week getting five swimmers on the Australian team and the squad generally swimming well. We’ve comfortably won it this year but I had thought it would be close. We’ve gained a few extra swimmers this year, but the whole team swam very well, which is perhaps surprising as you don’t always get everyone swimming at their best at the same time. It’s just come right this week. Giaan Rooney has obviously been very successful this week with two Australian and one Commonwealth record; it seems focussing more on backstroke is paying off. She went through a period where her freestyle went a little bit off, although she still swam 2 minutes flat the other week for 200m freestyle, so she’s still OK at that event, but the focus has been the backstroke. She’s now only 0.2 off the world record over 50m and continues to improve in the 100 with several swims in the low 61’s, so it’s looking pretty positive as we can make some further steps and I can still see a lot of improvements we can make in starts and turns. So are you game to say that she can go 60 point at the worlds? Oh for sure, there’s room for improvement from her swim this week so as a long as everything goes to plan I would be hoping that. Who do you see as the main rivals? Obviously Natalie Coughlin is the one to beat. That’s right, I mean Coughlin is way out there, being under the minute barrier, really because she is so good underwater and I think that is Giaan’s weakness in comparison. What about Michael Klim’s return to near his top form? Well it is exciting for Michael to be back at that level. He has been to hell and back over the last three or four years with shoulder operations after back operations after ankle operations, and to his credit, and through his strength of character, its been fantastic how he has persevered through that period of his life. It is exciting with the preparation we’ve had that he has pulled out those sort of times. I was happy with the 49 low in the 100 free and he is certainly looking good. What about Michael swapping to a fly kick in the last 10 metres of his 100m freestyle; it’s something he’s done for a while but what’s the thinking behind it? I don’t like it personally, he just goes to it as a habit thing, it’s not something that we practice and personally I don’t want him to do it, it is Michael’s choice to go that way. He just feels he can keep his rhythm better and that he loses his stroke rhythm with a flutter kick, but we’ve done biomechanical analysis to show that it’s slower, that his stroke rate increases and it’s not efficient so it isn’t something that I’m trying to pursue. Is it a case now that having hopefully got over the worst of the injures you’ve now got a base to build on between now and Montreal? He’s also keeping his arms a lot lower compared to his peak in 2000 and even compared to last year’s trials. Well certainly his arms aren’t as straight as they used to be and it’s just trying to make his recovery easier on his shoulders. Anything that is going to reduce the strain we’ve got to pursue; basically it’s just taking off the load a bit. It’s been reported that you don’t do a lot of fly in training with him because of his shoulders. Is that the case? None at all. It’s when we do the fly that it aggravates the shoulder and I’m not sure I want him to do it from here on. I think if it’s going to affect his freestyle and have an impact on his training then I don’t want him to do it. But we’ll see how it goes and make a decision further down the track. It was similar in 2003 when Matt [Welsh] broke the world record over 50m fly, we’d hardly done any fly at all, so that seems to be the key! So you’re saying that Matt won that world title with no specific preparation? That’s right. Before Matt was a backstroker he was a butterflyer but we did a minimal amount of training on butterfly, maybe 0.5% – a total for the season of maybe 400m – so it was a bit of a freakish performance. Same as when Michael broke the world record on 100m fly he was concentrating on 200m freestyle. I think people do too much fly in training and end up building bad habits when they start to struggle. If you are practicing that sort of swimming that’s what you’ll go back to when you’re tired. Matt’s on the team again this year, but looked far more comfortable over 50 and 100 than he did in the 200 – are you focussing on the shorter distances? I think Matt hasn’t got the confidence in the 200 at the moment. I think he can get back down to his best at mid 1:57’s but he loves the 100 more than the 200 and he just has the belief in that event. I think it’s just a case of doing a bit more racing over 200m to build his confidence up, as we’ve done hardly any 200m races. Over the next 12 months I still want to keep some focus on the 200 as I think that helps with the back end of the 100 as well. Brett Hawke was another of your swimmers that looked very good and seems to be swimming very well. Yes, we’ve added the 50 fly to Brett’s programme as well this week, which he also qualified in for Montreal, and we haven’t had a full taper coming into these trials so I think he’ll come up better at the World Championships. He was great last year to make the Olympic games final and set an Australian record of 22.07 and I think at the worlds that’s going to be close to the mark. So are you and he aiming for the Commonwealth Record – Roland Shoeman’s 21.98? Well that would be nice! Of course you want to continue to improve and I think there some things we can improve with Brett, like at the Olympics he missed the start and wasn’t quick enough away. If we get the perfect race then he can certainly go faster. You’ve got a very varied group of swimmers in your squad – how do you cope with the different demands of each athlete, in terms of the different events you have to prepare them for? It causes me a lot of stress having so many egos flying around! No, in all seriousness everyone gets along very well which is important. I do a sprint programme for Brett and Michelle [Engelsman] which is probably half the workload that the others do, but beyond that I only have 10 in my top group so it’s not as though I’m overloaded with swimmers. You mentioned your sprint programme; there’s a continual debate about high intensity/low volume training versus high volume/low intensity programmes. What’s your view? You can’t say that everything is right for every event. It’s the same as in horse racing – you can’t train the horses going 3200m the same as the ones who are going 1600m. Anyone who thinks that way is thinking the wrong way; it really is horses for courses. To work out the way you train an athlete you have to look at the event they are preparing for. Sure with distance swimmers you’re going to do that kind of high volume work but for the sprinters its a great way to kill them. It’s really an individual thing and age is a big factor, I’ve got a lot of older swimmers with the likes of Matt and Michael and they’re not going to recover as fast as some of the younger guys, so you really have to look at the individual and what they can handle in their training load. For example, Michael’s probably done less than he’s ever done over the last part of his preparation but is swimming to his best because he can recover and cope with the loads. That said it’s still important to have a good volume base when swimmers are young, just that as swimmers get older you need to do what’s right for them. Finally, what’s been your highlight swim of the week? Probably the one I was most nervous about was Giaan’s 100m back as I knew it was going to be tough, she wasn’t looking great in the warm up and the pressure was on so she could have missed the whole boat. But to her credit she put up a great fight and ended up winning the event in an Australian Record.